Fire And Smoke Solutions (FASS) prove their credentials as leaders in their sector demonstrating their expertise built on 30 years of experience working with market-leading companies and as experts in the design, installation, commissioning, testing and maintenance of all types of smoke ventilation systems. 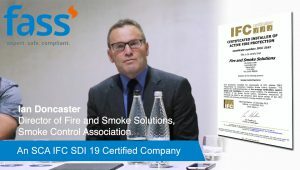 Ian Doncaster, Technical Director of Fire And Smoke Solutions said: “As long-term and active members of the Smoke Control Association, FASS contribute to the development of industry guidance and are pleased to be awarded the IFC SDI 19 certification. 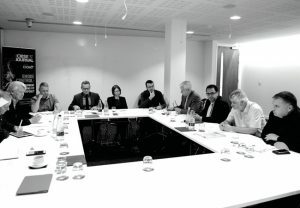 As Technical Director of FASS, Ian Doncaster was asked to represent the (SCA) Smoke Control Association at the recent CIBSE Round Table, titled, “Smoke control: are the current regulations fit for purpose?” a forum of industry experts brought together to discuss key issues coming out of the enquiry into Grenfell tower chaired by Dame Judith Hackett. He is also the IMechE representative on the BSI FSH25 fire standards committee, working on British Standards and represent BSI on the CEN standards committee for EN12101 parts 6 and 13. Ian agrees that the simplest designs are often best, but added that “complex buildings sometimes need complex systems. With these, we have to take on board the additional responsibilities to make them safe and maintainable,” he said. The golden thread of this strategy must be preserved throughout concept, design, commissioning, maintenance and testing, and overseen by a competent engineer, with input from the fire specialist. “this scheme underlines the importance that the industry assigns to raising competency standards and improving the quality of companies involved in installation activities,” said IFC Director of Certification, Ian Woodhouse.